Adding illustrations to a blog post is a very effective method to make it more attractive and readable for the visitors. A human eye is more sensitive to colors and pictures. No one likes to read long plain text articles. If you spice up your posts with relevant photos, you will observe a dramatic increase in your readership. But, adding eye-catching photos to the content requires some effort and experience. It's not just the relevancy of the photo but the added effects are what makes it an appealing addition to the content. You don't need to be a graphic design expert to add such effects to the photos. There are several online and offline tools for the same. This guide will not only make you familiar with different types of photo effects ideal for blog content but will also enlist some of the tools to make your job easier. If you're not used to adding photos to your content, initially, the process may look like a cumbersome exercise, but the results will astonish you. Let's see how to integrate customized photographs into our blog posts. Before we move ahead, a piece of advice to follow without any fail. No matter how you pimp up your blog photos, always optimize them for the web before uploading to the web server. There are two methods of embedding a photo into a blog post. While using the first method, we embed a picture in its original form without any kind of modification. The second method involves trimming, decoration, and the addition of various special effects to the photo to make it more attractive for the reader. Here are some methods to modify and enhance your pictures to make your blog posts, irresistible. 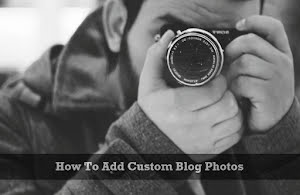 We'll start with the simplest yet the most effective photo customization ideal for blog posts. Frames and borders should be used both for the portraits as well as for the photos which include the primary subject of the article. An example is shown below with two different frame types purely created by CSS code. If you don't want to go with CSS-powered frames, you can directly create one within a photo editing application. While creating borders or frames, make sure they're not too jazzy or loud. Keep things simple to get the best results. If the image has a transparent background, do not add a frame or border around it. Another important thing to note is the consistency and uniformity of frames. Keep the border styles the same across the whole website. I strongly suggest avoiding creating 3D or shadow effects for the photo frames created for regular blog content. It's not just the frames or borders that add more weight to the images. Custom edges are a great way to enhance and to add more depth to the photos. There are 6 different types of edges shown below. The regular shadow effect (first one) is by far the most common type of effect used for photos used in web content. The second one is the fading effect ideal for conditions when you blend part of the photo with the content area background. The other edge effects viz., torn edge, shark tooth edge, and others are perfect ways to pimp up a photo. These edge effects draw immediate attention of the reader and make the content, interesting. While adding edges to the blog photos, make sure it looks good on smaller devices too. Avoid creating edges for photos displaying data or statistics. If you heavily share your content photos on different social media platforms, then avoid using edge effects for those images, altogether. We all know that a picture is worth a thousand words. But, what if we add speech bubbles to them as shown in the example below? Instantly, the photo comes to life and becomes interactive. And, that's what's the whole purpose of blogging on the web. If your blog photos (via speech bubbles) make your readers smile, cry, and laugh, you're essentially interacting with them in an indirect manner. So, do not hesitate in using this powerful medium to make your blog photos speak for themselves. Speech bubbles are of different types and one should carefully use the right format at the right place. The 2 classic speech bubble examples are shown above. The first one is the active speech bubble and the second one is the thought speech bubble. Other popular formats are cloud-shaped speech bubbles often used to present the collective voice of a group of subjects or objects. If the situation permits, feel free to add other kinds of photographic effects mentioned here along with the speech bubbles. If your blog writing involves a lot of data, statistics, and trends, I'm sure you back it up with a similar kind of graphics viz., charts, timelines, graphs, and tables. That's where the use of arrows and pointers is highly recommended. Using them enables you to pinpoint specific data values or data trends. They're also used to correlate, segregate, or group similar kind of data. Arrows can also be used for non-statistical photos if required. To get the maximum benefit, use shadow effect, color, and different types of line styles as shown above. If required, you can also adjust the opacity of the arrows and pointers. Another important thing to emphasize here is that overuse of arrows in a single photo can backfire. While using arrows with a data-intensive photo, pay attention to the color you choose. Using a matching or a similar color for the arrows is not recommended at all. Adding captions and headlines gives a strong statement not only about the photo you're using but also about the topic of the blog post. Normally, captions are added to the primary photo of a blog post supported by secondary pictures, if any. These are the very pictures one can use as a primary photo on various social media platforms like Pinterest and Instagram. Images with such headlines or captions are generally, vertically long. This is one of the photo effects with ample scope of customization. Correct color contrast relative to the background is the key to making an effective headline or a caption. Similarly, opacity adjustments help in making the headline, easily legible. It's not just the graphics effect that matters for a headline or a caption, but the most critical part is the copy used for it. The most catchy, easy-to-understand, and context-sensitive it is, the more it makes the photo powerful and effective. Use it for your blog photos, without any fail. Another powerful way to make the readers focus on a part of the image is to use a spotlight or a magnifying effect. These two effects can either be used exclusively or in conjunction. The spotlight effect is primarily used to emphasize an important part of a fairly colorful or a complex image. On the other hand, a magnifying effect is generally recommended for enlarging a part of the image to let the reader focus on it, easily. There are two more important effects which perfectly complements these photo-enhancing jobs. The first one is a darkening or fading effect for the surrounding area as shown in the example above. The other one is the blurring effect for the surrounding area to make it absolutely certain that the reader's attention is only focused on the target area. Spotlight and magnifying effects can also be used on data-intensive images to highlight an important deviation or a trend. Sketches are a great way to keep your readers glued to the article. They're best suited for long-form content which generally readers find boring to consume. Now, most of us are not professional sketchers! Then, how to create such illustrations for our blog content? Well, not to worry about it! I've mentioned a few specialized tools below one can use to easily and quickly make professional-grade sketches and mockups. So, keep reading! The best form of sketchy illustrations includes speech bubbles or captions as shown in the example above. The background of such illustrations should be selected carefully. In most cases, a transparent or a white background works fine. A sketchy infographic has the power to make your post, go viral. If required, one can also embed regular images within a large sketchy illustration. There are several professional sketch artists on the web. If your budget allows, do not hesitate in taking their services. As shown above, there are literally hundreds of special effects that can be added to the blog content photos. Remember, the time you will devote to customize these photos will never get wasted. A blog post supported by relevant photos brings more traffic and more engagement from the readers. And now, let me enlist some of the favorite tools I myself use to pimp up my blog photos. For creating impressive sketches and mockups, I rely on SimpleDiagrams and Balsamiq Mockups. Both these tools can be used even by a layman to create excellent sketchy illustrations. For various other effects mentioned in this guide, I've used TechSmith Snagit. All these 3 tools are premium solutions worth giving a try. And, if you prefer a classic photo editing application, free and open source GIMP is your best bet. There are plenty of good GIMP tutorials one can follow to master this powerful photo editing application.